Set aside half the Southwestern simmer sauce blend for the tostada sauce. In a small sauce pot, stir together half the simmer sauce blend and ¾ cup [1½ cups] lightly salted water, then add the quinoa. Bring to a boil, reduce to a simmer, cover, and cook until the quinoa is tender and the liquid is absorbed, 15 to 20 minutes. Fluff with a fork, stir in the beans, cover, and keep warm. While the quinoa cooks, prepare the tortillas. On a sheet pan, brush the tortillas all over with 1 tablespoon [2 TBL] oil and season with salt; arrange side by side. Toast in the oven, turning halfway through, until the tortillas are crisp, 12 to 15 minutes. Transfer the tortillas to a plate. While the tortillas toast, prepare the cabbage slaw. Cut the avocado in half lengthwise. Remove the pit, scoop out the flesh, and cut the flesh into ¼-inch-thick slices for garnish. In a medium bowl, toss together the cabbage, carrots, tomatoes, cilantro, 1 tablespoon [2 TBL] lime juice, and 1 tablespoon [2 TBL] oil; season to taste with salt and pepper. In a small sauce pot over medium heat, combine the remaining simmer sauce blend and ¼ cup [½ cup] water and cook, stirring occasionally, until warmed through, 3 to 4 minutes. Transfer the tortillas to individual plates. Top with the quinoa–black bean mixture and tostada sauce, spoon on the slaw, and garnish with the avocado. Serve with the lime wedges. Prepare the tortillas for crisping. 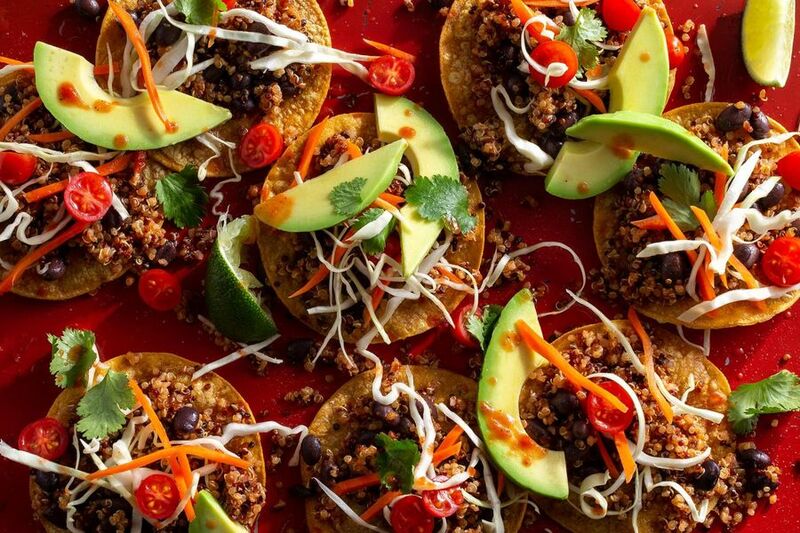 For these plant-based tostadas, we cook quinoa and black beans in our smoky simmer sauce, then pile them on crisp tortillas with creamy avocado and a juicy slaw. If you have time, you can crisp the tortillas on the stovetop: In a large frying pan over medium heat, warm 2 to 3 tablespoons oil until hot but not smoking. Working in batches, add the tortillas and cook, turning once, until crisp, 2 to 4 minutes per side. Transfer to a paper-towel-lined plate and season with salt. Calories: 750, Protein: 19g (38% DV), Fiber: 26g (104% DV), Total Fat: 36g (55% DV), Monounsaturated Fat: 22g, Polyunsaturated Fat: 5g, Saturated Fat: 4.5g (23% DV), Cholesterol: 0mg (0% DV), Sodium: 370mg (15% DV), Carbohydrates: 98g (33% DV), Total Sugars: 14g, Added Sugars: 0g (0% DV).